Tired of choosing your villa based on a few thumbnail photos on a Website, or a herky-jerky "virtual tour"? Choose a villa...by visiting the villa. Or visit several. 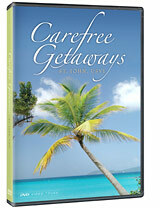 Carefree Getaways is pleased to introduce our new DVD featuring beautiful video tours of some of our featured villas. These full length videos show all interior and exterior spaces, as well as each property's unique views. Please help us keep costs low, and pay $5 for shipping and handling of the DVD. Carefree Getaways will gladly credit the $5 toward the rental of one of these, or any other villa we manage. We believe these video tours do a much better job of showcasing our villas, and we will be adding more of our properties in the future. Just click the link below and make a secure Amazon payment of $5 plus shipping and handling. You will be sent a confirmation e-mail and should receive the DVD within two business days. This DVD is currently being updated as is currently not available. We?re sorry. Please check back later.